This is part of a series of articles describing how to use the new features of vSphere Integrated Containers (VIC) v0.4.0. In previous posts, we have looked at deploying your first VCH (Virtual Container Hosts) and container using the docker API. I also showed you how to create some volumes to provide consistent storage for containers. In this post, we shall take a closer look at networking, and what commands are available to do container networking. I will also highlight some areas where there is still work to be done. Also, please note that VIC is still not production ready. The aim of these posts is to get you started with VIC, and help you to familiarize yourself with some of the features. Many of the commands and options which work for v0.4.0 may not work in future releases, especially the GA version. I think the first thing we need to do is to describe the various networks that may be configured when a Virtual Container Host is deployed. The bridge network identifies a private port group for containers. This is a network used to support container to container communications. IP addresses on this network are managed by the VCH appliance VM and it’s assumed that this network is private and only the containers are attached to it. If this option is omitted from the create command, and the target is an ESXi host, then a regular standard vSwitch will be created with no physical uplinks associated with it. If the network is omitted, and the target is a vCenter server, an error will be displayed as a distributed port group is required and needs to exist in advance of the deployment. This should be dedicated and must not be the same as any management, external or client network. 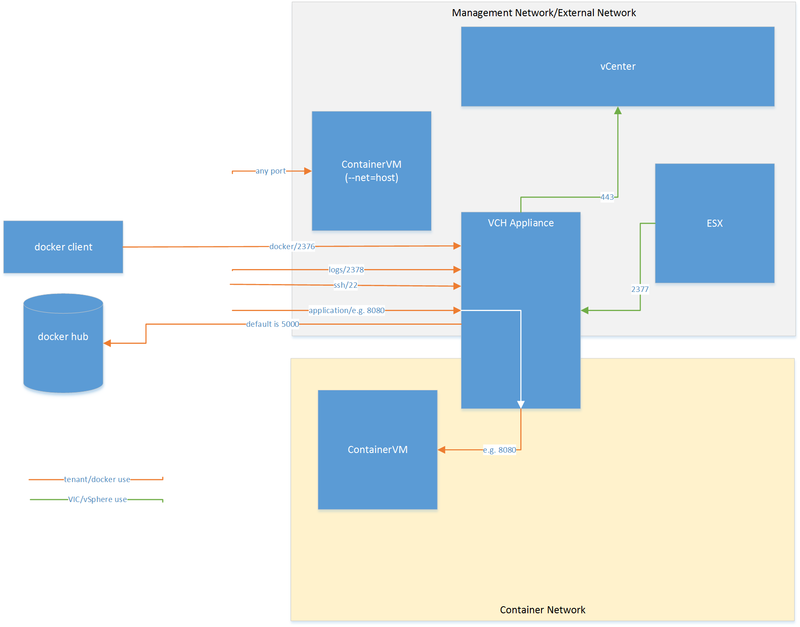 The management network identifies the network that the VCH appliance VM should use to connect to the vSphere infrastructure. This must be the same vSphere infrastructure identified in the target parameter. 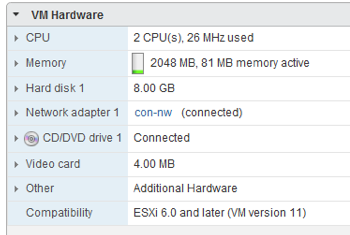 This is also the network over which the VCH appliance VM will receive incoming connections (on port 2377) from the ESXi hosts running the “containers as VMs”. This means that (a) the VCH appliance VM must be able to reach the vSphere API and (b) the ESXi hosts running the container VMs must be able to reach the VCH appliance VM (to support the docker attach call). The external network. This is a VM portgroup/network on the vSphere environment on which container port forwarding should occur, e.g. docker run –p 8080:80 –d tomcat will expose port 8080 on the VCH appliance VM (that is serving the DOCKER_API) and forward connections from the identified network to the tomcat container. If –-client-network is specified as a different VM network, then attempting to connect to port 8080 on the appliance from the client network will fail. Likewise attempting to connect to the docker API from the external network will also fail. This allows some degree of control over how exposed the dockerAPI is while still exposing ports for application traffic. It defaults to the “VM Network”. The client network. This identifies a VM portgroup/network on the vSphere environment that is the network which has access to the DOCKER_API. If not set, It defaults to the same network as the external network. This is the name of a network that can be used for inter-container communication instead of the bridge network. It must use the name of an existing distributed port group when deploying VIC to a vCenter server target. An alias can be specified, but if not specified the alias is set to the name of the port. The alias is used when specifying the container network DNS, the container network gateway, and a container network ip address range. This allows multiple container networks to be specified. The defaults are 172.16.0.1 for DNS server and gateway and 172.16.0.0/16 for the ip address range. If container network is not specified, the bridge network is used by default. Let’s run some VCH deployment examples with some different network options. First, I will not specify any network options which means that management and client will share the same network as external, which defaults to the VM Network. My VM Network is attached to VLAN 32, and has a DHCP server to provide IP address. Here are the results. Now, let deploy my external network on another network. This time it is VM Network “VMNW51”. This is on VLAN 51, which also has a DHCP server to provide addresses. Note once again that the client and management network use the same network as the external network. Now let’s try an example where the external network is on VLAN 32 but the management network is on VLAN 51. Note now that there is no message about management network sharing NIC with client. So we can see that it has been assigned an ip address of 172.16.0.2, and that the DNS server and gateway are set to 172.16.0.1. This is the default container network in VIC. The first thing to note is that since I am deploying to a vCenter Server target, the container network must be a distributed portgroup. In my case, it is called con-nw, and the parameter –container-network specifies which DPG to use. You also have the option of adding an alias for the network, separated from the DPG with “:”. This alias can then be used in other parts of the command line. If you do not specify an alias, the full name of the DPG must be used in other parts of the command line. In my case, I made the alias the same as the DPG. This is one of the advantages of VIC – visibility into container network configurations (not just a block-box). As I keep mentioning, this product is not yet production ready, but it is getting close. The purpose of these posts is to give you a good experience if you want to try out v0.4.0 right now. With that in mind, there are a few caveats to be aware of with this version. Port exposing/Port mapping is not yet working. If you want to run something like a web server type app (e.g. Nginx) in a container and have its ports mapped through the docker API endpoint (which is a popular application to test/demo with) , we cannot do this at the moment. You saw the DNS encoding errors in the VCH create flow – these are cosmetic and can be ignored. These will get fixed. The gateway CIDR works with /16 but not /24. Stick with a /16 CIDR for the moment for your testing. With those items in mind, hopefully there is enough information here to allow you to get some experience with container networks in VIC. Let us know if you run into any other issues.